In my opinion, the easiest answer to this question is everyone. 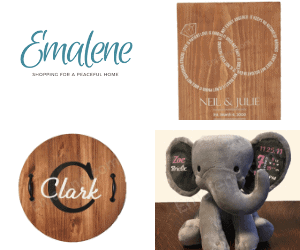 Do you have kids? Pets? Even if you don’t, I’m sure there have been times when you spilled food or drink or maybe make up on the carpet. After the initial “Oh shoot!” what did you do? I used to grab some paper towels and spray carpet cleaner (or water if I didn’t have a cleaner) and then I would start spraying and blotting, spraying and blotting, over and over. And after all that, there were mixed results as to whether it would work or not. Now, I just grab my Bissell Green machine and mix in some carpet cleaner and water and get to work. 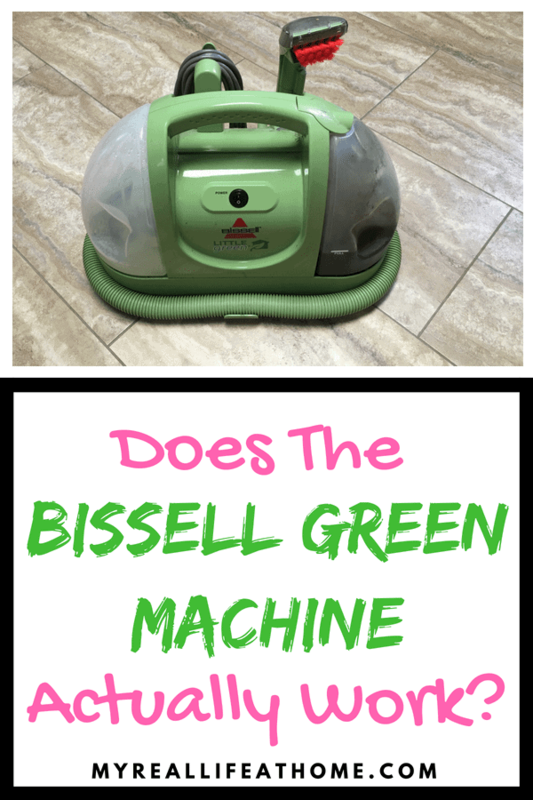 Why The Bissell Little Green Machine? 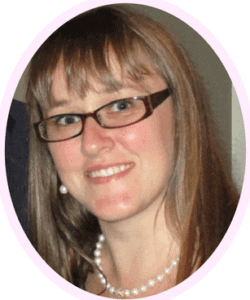 My first reason is that it is so easy to use with great results! 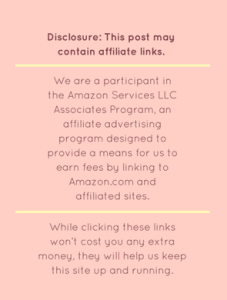 I understand that you probably want more information than that before making your purchase. So here are some other reasons why the Little Green machine is a great choice. 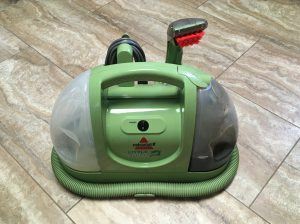 The Bissell Little Green machine has great suction which can remove that deep-down dirt, spot, and even stain. Spot cleaners, like the Little Green Machine combine hot water, cleaning solution and suction to clean the exact spot you need. No need to waste cleaner or time by having to clean a large area when in reality you just need that one spot or stain. Just spray and clean what you need. I realize there may be times when you want to clean the entire carpet in a room. Since the brush is only a few inches wide, this is not the cleaner for that. I would recommend researching and purchasing an upright cleaner, similar to a vacuum style. If you don’t want to spend the money on purchasing an upright cleaner, you can rent a high-quality machine at a lot of home improvement stores. I know around us Lowes, Home Depot and even Walmart rent them at very reasonable rates. If we are doing whole rooms, we will just rent a machine for a day or two. Now back to the Bissell Little Green machine. We have also used ours many, many times to clean our truck carpets and seats. Again, between kids and a large dog as well as outside elements (mud, snow, etc), things tend to get dirty. Since the machine is smaller in size, it works great for vehicle floors, carpets, and even seats. When I clean the vehicle seats, I spend extra time suctioning all the moisture out of the seat before moving on. I have also used it to clean stains off of furniture. Again, as when I clean the seats in our vehicle, I suction a little longer to make sure I get out as much moisture as I can. Due to its compact size, it is also great to use on stairs or other areas where you wouldn’t be able to use an upright cleaner. It has a long hose and cord to allow you to get to those areas. As I mentioned before, it is really easy to use. There are two reservoirs on the machine – one on each side. One side is for the solution mixture and the other is the dirty water that you will be suctioning up from the carpet, furniture or whatever you are cleaning. Be warned, that side can get nasty and it will need to be rinsed out. 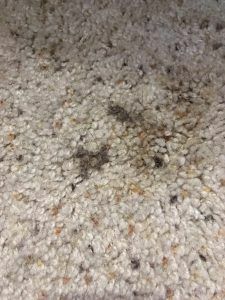 You will add your carpet cleaning solution along with hot water the clean reservoir. There are many kinds of carpet cleaning solutions that you can buy. I usually use a pet stain and odor solution but purchase whichever solution fits your household needs the best. On the reservoir, there is a line to show how full to fill the reservoir with your mixture. After I have added my solution mixture and plugged it in, I turn on the machine and simply spray the solution onto the stain using the trigger on the brush handle. 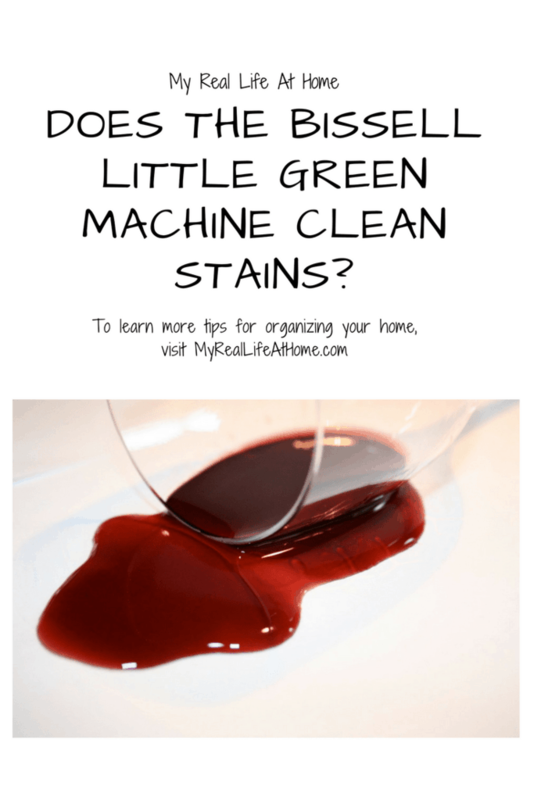 Depending on how severe the stain is, I will sometimes turn the machine off and just brush the solution back and forth and let it sit for a few minutes. (If the machine is on, it will automatically suction up the solution so I turn it off to allow me to scrub it and let it sit.) After that, I turn the machine back on and start suctioning the dirt/stain. You may need to spray and suction a few times to remove the stain, depending on what the stain is or how severe it is. It really is that simple. Recently, I painted our living room and I had to move the couch and side table away from the wall. Somehow the carpet got stained behind the furniture. I have no idea how long the stain had been there or what it was even from. So, I went to the closet and grabbed our Green Machine. I sprayed and then scrubbed for about a minute and then suctioned the solution up and here are the results. While it is a little hard to tell in the picture, the stain was removed! Thank you Little Green Machine! As I am sure you have gotten from reading my review, I think this is a great spot stain cleaning machine at a reasonable price. The only negative I have found is that cleaning the brush and dirty water reservoir can be difficult. Unfortunately, the brush doesn’t come apart so it does not allow for easy cleaning. Also, it is hard to find something to fit into the reservoir to clean. I usually end up mixing some cleaner in the dirty reservoir and letting it sit. I’ll then try and shake it around a little (trying to not spill) to loosen up the dirt and then rinse it out the best I can. It’s never perfect but it’s good enough. After all, it is dirty water that is going in there. I’m not the only one who thinks it’s a great machine either. 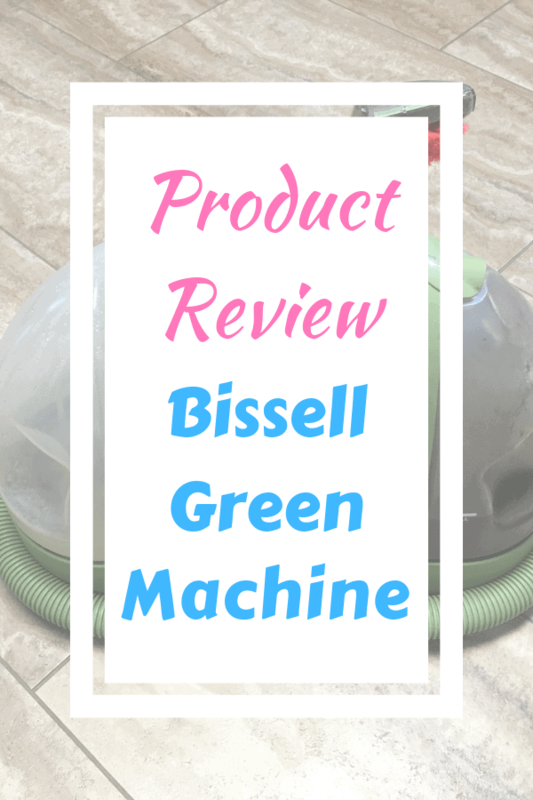 On Amazon, the Bissell Green Machine Carpet Cleaner has a 4.4 out of 5 stars rating. I know we are glad we purchased it and I’m sure our carpet is too! (You’ll notice my little green machine is a little dirty since it is used regularly). If you are looking for a portable, spot stain cleaner this could easily be the one for you too! I would love to know if you have any thoughts on this machine. Been thinking about getting a carpet cleaner but didn’t want a big bulky one. This one would be perfect. 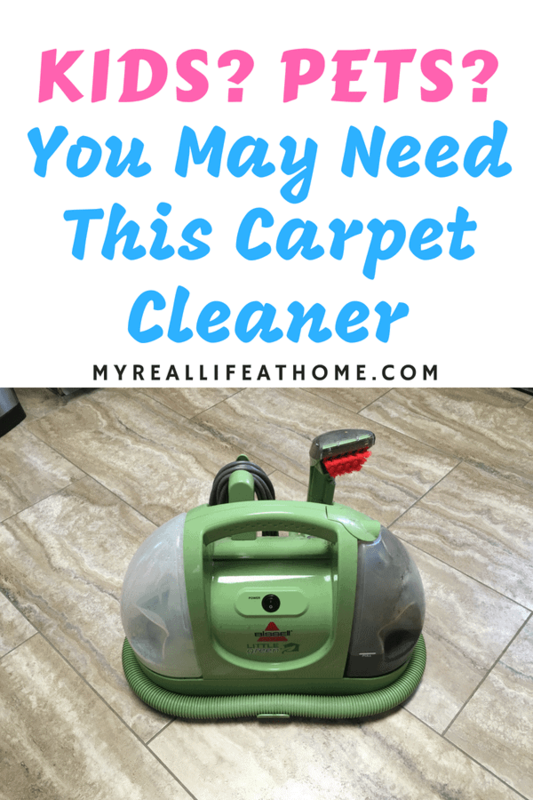 It is a great little carpet cleaner that works well but is compact. 🙂 That’s why we love it. Nice to know this works really well! I don’t have a ton of carpet in my house, but there is some and my dog sheds a LOT! The little green machine works great for pet stains. 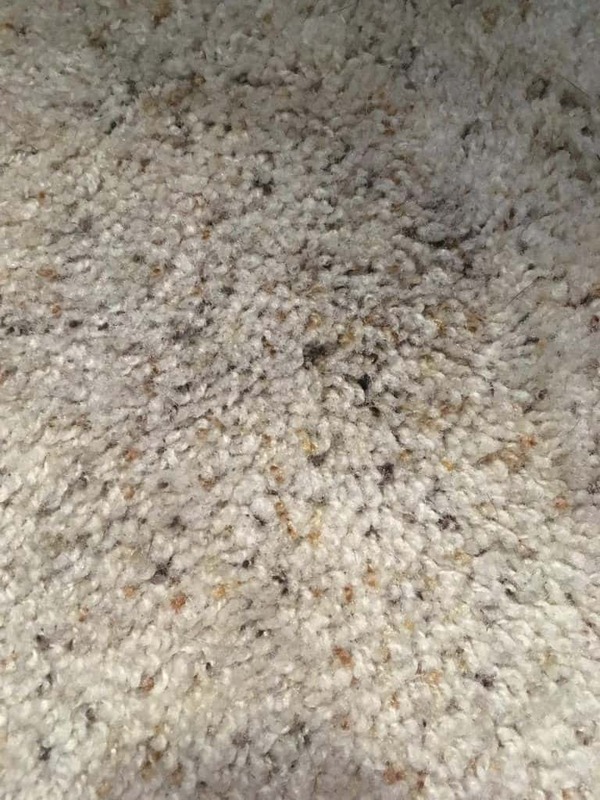 I need a new carpet cleaner. The one I have is like 20 years old, haha. This one seems perfect. I can’t believe you can use it for your cars! It is definitely great for cars. A week after we got our new truck, one of our kids spilled red fruit punch on the floor. Thankfully our little green machine was able to get most of it out so it is barely noticeable. This sounds great and I love how small it looks. I will have to consider purchasing one. I love the size. It fits it in the back of our hallway closet perfectly.